An artist's illustration of one concept for NASA's planned Wide-Field Infrared Survey Telescope, a potentially powerful space observatory. Using a donated spy-satellite telescope would improve the science capabilities of a high-priority potential NASA mission, but such gains could come at a significant financial cost, a new report concludes. 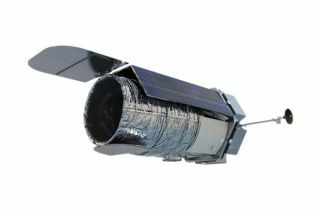 The report, unveiled Tuesday (March 18) by the U.S. National Research Council (NRC), looked into the impacts of a proposed redesign for NASA's Wide-Field Infrared Survey Telescope (WFIRST), which the NRC deemed the top-priority large space mission in its 2010 astronomy and astrophysics "decadal survey." But NASA started thinking bigger in 2012, when it received from the U.S. National Reconnaissance Office hardware for two 7.9-foot (2.4 m) space telescopes — the same size as the agency's iconic Hubble Space Telescope. "The opportunity to increase the telescope aperture and resolution by employing the 2.4-m AFTA mirror will signficantly enhance the scientific power of the mission, primarily for cosmology and general survey science, and will also positively impact the exoplanet microlensing survey," they wrote. However, they added, the risks of cost growth are considerably higher if the AFTA hardware is used. For example, a WFIRST/AFTA mission would likely cost around $2.1 billion, compared to $1.8 billion for an earlier design similar to the baseline WFIRST idea. The evolution of space telescopes is sparking innovation in space observatory design. See some far-out space telescope concepts of the future in this Space.com infographic. The price tag would likely increase even more if WFIRST/AFTA includes a coronagraph, an instrument that blocks out a star's light to aid in the study of dim orbiting exoplanets. But it's hard to say just how much costs would increase, since there has been little study about how a coronagraph would be accommodated on the mission, the report states. The report's authors therefore recommend that NASA should work hard to mature a coronagraph design and come up with reliable estimates about the technology's cost, performance and development schedule. "Upon completion of this activity, and a cost and technical evaluation of WFIRST/AFTA with the coronagraph, an independent review focused on the coronagraph should be convened to determine whether the impact on WFIRST and on the NASA astrophysics program is acceptable or if the coronagraph should be removed from the mission," they wrote. The report does not recommend which design NASA should choose for the WFIRST mission.